The Desmostylia are an extinct group of marine mammals. They are both strange and enigmatic creatures known only from deposits of the Late Oligocene and the Miocene. Fossils assigned to four genera have been found in Japan and along the west coast of Mexico and the United States, to as far north as Washington. Fossils of Desmostylus were first described in 1888 by Othniel Marsh, from marine deposits collected in Alameda County, California. The fossils were considered to represent Sirenians, and subsequent fossils found in Japan were interpreted as possibly being primitive Proboscideans (elephants) or Sirenians (sea-cows), though not without significant differences from either group. Top and side views of a tooth from Desmostylus. Photos by Sarah Rieboldt, © University of California Museum of Paleontology. 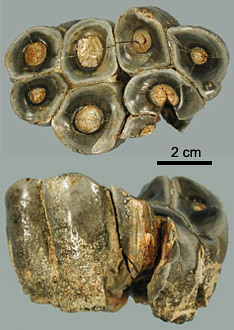 Desmostylians are noted for having a number of bizarre and unique physical features, such as the tooth shown at right. The teeth and the pattern of wear in their enamel are unlike that observed in any modern mammal, and so no one is yet certain just what these short-tusked, shovel-jawed animals ate. This problem is compounded by the changes in coastal marine floras of the Miocene as kelp forests developed. The best evidence suggests they were herbivores, but anything beyond that is a guess. Analogies have been made between the structure of desmostylians and the hippopotamus, though their lifestyle may have been more like that of the sealion. Fossil skeletons indicate that, unlike sea-cows, desmotylians were capable of moving around on land, but it is believed they did so primarily for rest or to mate. The problematic morphology and relatively short stratigraphic range of these animals has caused them to be placed in a separate mammalian order. Their closest relatives include the elephants and sea-cows. Domning, D.P., C.E. Ray, and M.C. McKenna. 1986. Two new Oligocene Desmostylians and a discussion of Tethytherian systematics. Smithsonian Contributions to Paleobiology 59:156.